Everyone at VAC hopes that you had a great summer. As we head back to school or back from vacation we want to remind you of our training class on October 11th and 12th, introduce you to some new mounting kits, and discuss a technical tip. A special thanks to the attendees of our training class in May. 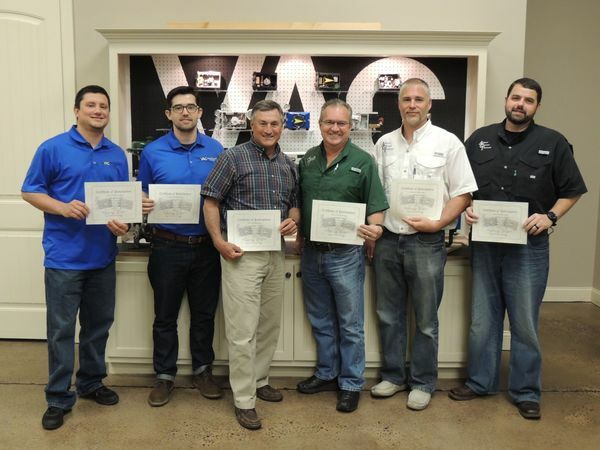 The guys pictured below are from left to right, front row: Rob Mueller with Wolseley, Matthew Page with Advanced Valve and Instrument, Bo Sellers with Advanced Valve and Instrument, Jeff Greene with Quality Valves, Jason Browning with ACT and Matt Hannon with ACT. We do have openings for our October 11th and 12th class. If you are interested in going or sending someone from your company please call us at (205)678-0507 or email Tammie Hughes, these spots will not last long!!! VAC now offers mounting kits for select Badger/RCV and Valtek actuators. These mounting kits are being offered in all Stainless Steel construction. The Badger/RCV 754 series mounting kit (P/N 350287) has been designed to work with only the D400/D500 digital positioner. The diminutive size of the 754 actuator does not allow it to be used with the V100/200 positioners due to the feedback spring in the positioner overpowering the actuator. The mounting kit for the Badger/RCV PA35 actuator (P/N – 350288) was designed to be used with either the D400/D500 or V100/200. The Valtek kit (P/N -350289) has been designed to work with both the D400/D500 and V100/200 positioners. 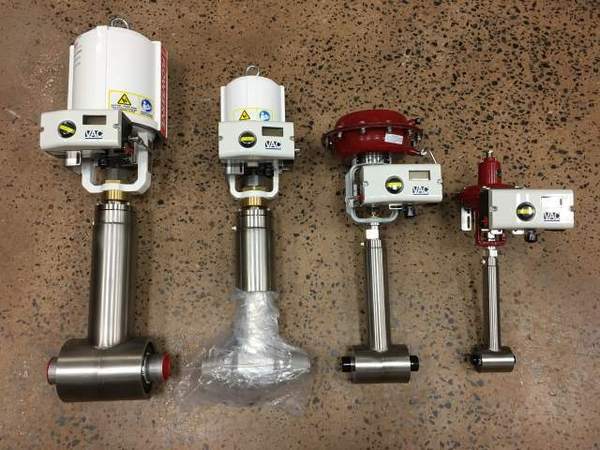 The Valtek kit has been confirmed to fit on actuator sizes up to 50 sq/in and we are currently working to confirm fitment on larger sizes. For questions about the kit please email Scott Kratz here. One of the most common technical support calls VAC gets on our V100 and V200 is when no input signal or very little input signal is given to the positioner and then the valve package will open. There are 2 possibilities that we need to explore to get our positioner to operate correctly. One is tubing, when we turn on the air with no input signal air will be exhausted out of the C- port. So if we are at close and our tubing is backwards, the air going out of C- will cause the valve to open and the control signal if ever turned on will have absolutely no affect on the positioner. To fix this problem we must first put the valve where it is desired to be at 0% input signal. Then turn off the air, and finally swap the C- and C+ tubes around. When we apply air back to the positioner the valve package should not move. The second occurrence is when the cam is not on tight. We must make sure when we loosen the cam nut to mount the positioner, we must then remember to set the cam properly per the IOM of the V100 or V200, and then tighten the cam nut first then the tighten the locking screw. 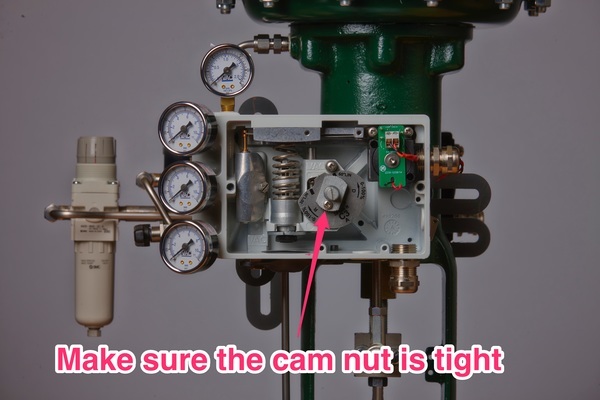 If the cam nut is loose the positioner will go to full open this may happen either when a slight input signal is given or at 0% of input signal, then the valve package will go to 100% it will not stop in between. To fix this we must put the valve back at desired position at 0% input, then turn off the air, set the cam, and finally tighten the cam nut and locking screw. Our VAC website has a section called Technical Quick Help. Please take a look and always always if there is any issue to call anyone at VAC, (205)678-0507. The worst problem that we have are the problems we do not hear about.